At Wyman Park, Mayor Pugh watched as workers detached and hauled away statues depicting Confederate generals. UPDATED 9 a.m.
After years of protest, task forces and debates over whether Baltimore’s Confederate monuments should be removed, the deed was done in a few hours under cover of darkness. 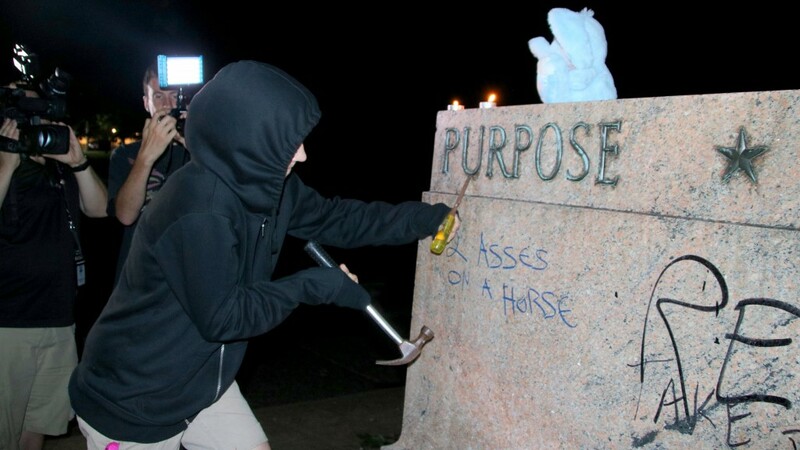 Amid vows by local activists to take matters into their own hands following protests in Charlottesville, Va. that turned deadly, city officials took all four monuments down in the early hours this morning. 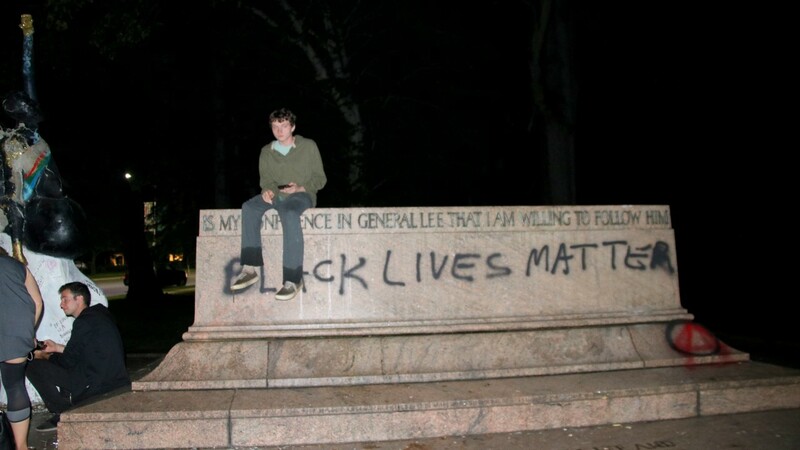 By 5 a.m., all that remained of the Lee and Jackson Monument in Wyman Park Dell was its marble base defaced by graffiti. Votive candles flickered amid broken glass. The bronze statues showing Confederate Generals Robert E. Lee and Stonewall Jackson sitting on horses were gone. Activists showed cellphone photos of some of the action, trucks with cranes lifting them up. Another showed Mayor Catherine Pugh watching from a distance away. Unlike the removal of a Robert E. Lee monument in Durham, N.C. the previous night – undertaken by people who scaled it with a ladder and toppled it in a few minutes – the process in Wyman Park was more measured. 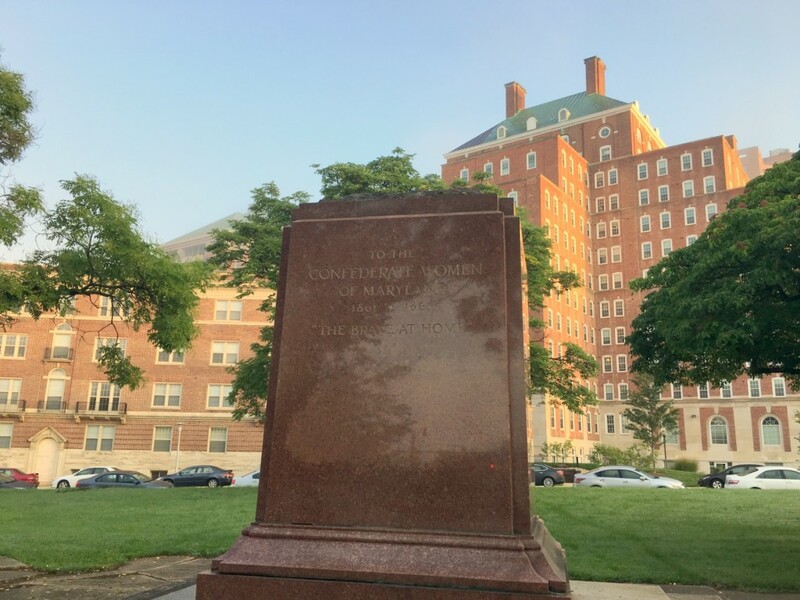 “They did it very carefully, it seemed like they didn’t want to damage it,” said Payam Sohrabi, of Baltimore Bloc, standing beside the Lee and Jackson Monument. Photos on social media showed workers removing the city’s other monuments: the Confederate Soldiers and Sailors Monument in Bolton Hill, Confederate Women’s Monument on North Charles Street and the Roger B. Taney Monument in Mt. Vernon Place. Behind him, as television crews filmed, a woman with her face covered chiseled one of the bronze letters off the monument base. “Save me a star,” someone said. By first light today, the Wyman Park site was a hive of activity, attracting a swarm of local and D.C. media and a steady stream of passersby who came to circle the pedestal and snap photos. For some, the controversy was the first they heard that the figures on horseback were Confederate generals and that the monument was a flashpoint for controversy. “At first, I didn’t realize it was a Confederate statue. I’m an animal lover and it was just these men and horses,” said Tara Fournier, who lives not far away from the statue in Charles Village. Now that she realizes what they are and mean to people, she said, she supports removing them. James MacArthur, a longtime city blogger and activist, pointed out that the removal, which he watched, was conducted in front of a crowd of people who watched peacefully. “It was not done by an angry mob. The police didn’t have to hold people back,” he said. He also observed that the removal was amazingly rapid, considering the mayor’s stance two days earlier that a work group must guide fundraising, legal strategy and logistics. “It’s amazing – when they want to get things done, how quickly they can do it,” he remarked. A contractor, Andrade Johnson, 47, said the country under President Trump is “at a scary moment” and that removal of the monuments sets a hopeful tone. On Sunday, more than 1,000 demonstrators gathered at the Lee and Jackson Monument to condemn the messages of racist and antisemitic hate in Charlottesville and demand that Baltimore’s Confederate monuments be removed. On Monday morning, Mayor Pugh said she wanted the monuments removed and was in the process of appointing a working group of staffers to guide the process. On Monday night, Baltimore Bloc threatened to remove the monuments. Others online made the same vow. A #doitlikedurham hashtag began circulating. Sohrabi said his group’s ultimatum probably played a part, but the embarrassment of delaying the removal of pro-slavery Confederacy symbolism in a majority black city finally became too much for Pugh.